Like the producers of The Hurt Locker before it, the production company behind The Expendables is suing those who allegedly pirated the film. Nu Image Films, in conjunction with The U.S. Copyright Group (USCG), is going after the thousands of people who shared The Expendables on BitTorrent. 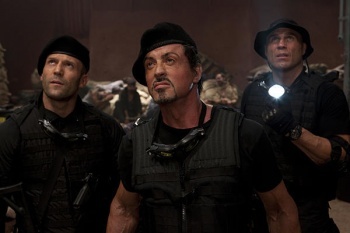 The much-maligned Expendables, which came out in August 2010, did pretty well at the box office, but was still widely pirated. The Hollywood Reporter, in detailing the mass lawsuit, says, "The indie mini-studio is said to have signed up for the mass-suing over the holidays." In prosecuting these file-sharers, the USCG subpoenas ISPs in order to identify those individuals who have been sharing copyrighted material. The USCG then sends those folks a letter with settlement information, along with the proviso that, should file-sharers refuse to settle, they'll be subject to litigation. The Hollywood Reporter notes that mass lawsuits like this are difficult to pursue, and not all identified, settlement-refusing pirates will be prosecuted further, as "USCG has signed up about 15 firms who will serve as local counsel around the nation, and each will have discretion on which non-settling defendants to pursue in follow-up litigation." These firms perform background checks as has been done in previous cases, and "those who live in 'a $100,000 house' may be more appealing targets than those who live in a '$10,000 trailer.'" So, rich folks who pirated The Expendables, keep an eye on your mail.